Posted by admin on July 17, 2010; This entry is filed under Design Role Analysis, Enabling, France, Nord-Pas-de-Calais, Periurban Area, Pévèle, Pévèle > Periurban area > Nord-Pas-de-Calais > France. The 2 years of experimentation of Territoires en Résidences programme were thought as an action-research progressive definition of the residences as a tool. The idea of residences as immersive and participative project-oriented sessions is not new. Artists hosted in residences are offered the appropriate conditions to co-develop a new creation more or less in interaction with the hosting place and its inhabitants. Territoires en Résidences programme takes inspiration form the setting of residences of artists for the immersive and collaborative project development posture. But unlike them, the purpose of Territoires en Résidences is to come up with a range of projects in terms of new services, organisations modes, changes in infrastructures… to serve the social and sustainable development of the hosting place. The original methodology of this new type of residences in public institutions was progressively developed through an iterative learning process capitalising on the experiences of the first 5 residences. At this stage, a first toolkit was edited in order to facilitate the sharing of the first experiences and accelerate the briefing of the new residents teams. This toolkit was presented as a Resident Guide based on a series of pages posted online for a shared use and upgrade between all the participants to the Territoires en Résidences programme. 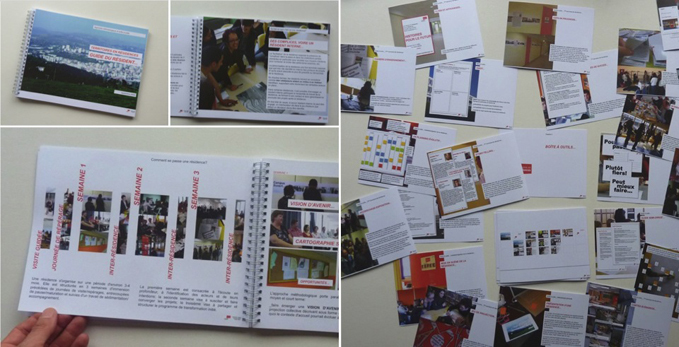 Hard copies in forms of a booklet or separate deck of cards to facilitate personalisation of the methodology are given to each new resident teams. The Resident Guide is based on 3 sections: a general overview of a residence defining the approach and main features; a chronological narration of a typical residences process; a toolbox with compulsory tools, favourite and other ones.